Sree Rama Mess (Or Raju Mess, as it's famously known) adds cool to the good old homemade food. Located in Malkajgiri, this mess is a hidden treasure of Secunderabad, and we checked it out. Located on the ground floor of a nondescript apartment, Raju Mess has no boards or names marking its territory, except a signboard at the entrance of the road. When you step into the mess, you'll notice how tiny it is. No, really, it has just 5 tables, and you might have to share your table with fellow eaters. It's super clean and the plate meals are served right after you order. This 30-year-old mess was started by Raju and his mother, and no matter what hour of the day, it's always packed. The package of great food comes along with conversations as Raju can get really chatty. Politics, cinema, random conversations are served at your table, piping hot, like your rasam. 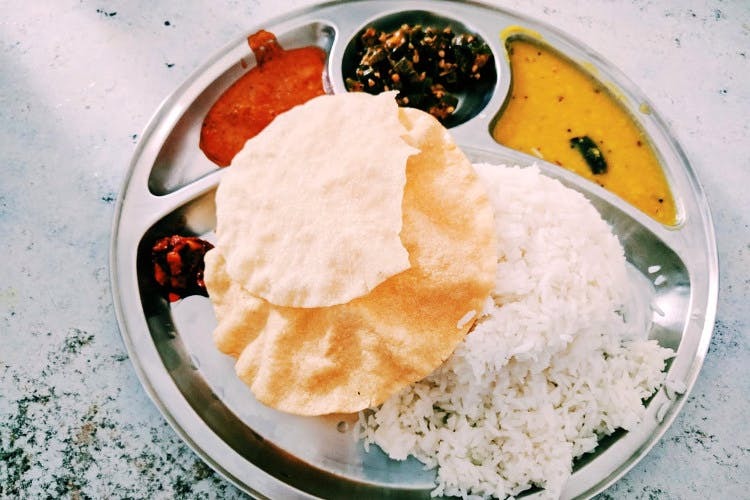 The meals come with unlimited rice, dal, curry of the day, chutney, pickle along with sambar and rasam. You cannot stop with one item as everything on the menu is delicious. Not too spicy, not too bland, just the right flavour. The sambar, quite literally, left us in pangs of joy as it's the best we've had outside Chennai. The rasam was a little peppery and tangy and went really well with our rice while the dal was a simple affair. There's also homemade papad for you to crunch on. Expect to be served more than you can consume as Raju believes in hearty meals. Too far from Malkajgiri and think you cannot drive all the way there? We urge you to think otherwise and get here one afternoon. And oh, he serves pongal for breakfast only on Sundays, and we heard it's absolutely divine.